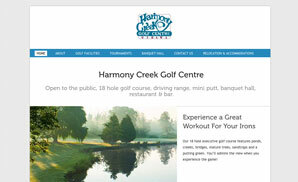 Established in 1992, Harmony Creek Golf Centre is an 18 hole executive, yet challenging course that is open to the public. It represents an excellent test of your target golf skills. Customers can experience a great workout for their irons as they navigate their 18 superbly crafted holes. It is also a full service banquet facility which features seating for up to 150 people and is fully licensed by the AGCO. The project was to redesign the existing WordPress website to a responsive design to allow it to be viewed on mobile devices.